(CNN) -- Officials recommended that more than 70,000 residents of the East Texas town of Bryan evacuate Thursday after a fertilizer warehouse caught fire, sending thick clouds of orange, toxic smoke into the air. 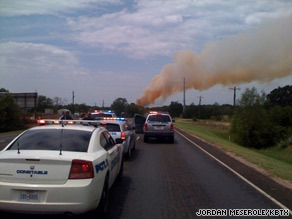 City officials say they are worried the burning fertilizer could irritate skin and lungs. Another 10,000 residents of surrounding Brazos County were also included in the evacuation recommendation, officials said. City Manager David Watkins said 10 people were taken to a hospital with respiratory problems. Residue from the burning fertilizer ammonium nitrate can irritate skin and lungs. Smoke from the smoldering El Dorado Chemical Co. warehouse could be seen for miles. Watkins said he expected the fire to burn well into the evening, and that firefighters were not trying to extinguish the blaze, but were simply trying to keep it from spreading. Classes at nearby Texas A&M University were canceled, and the school opened Reed Arena, which can hold 12,000 people, for use as a shelter. "We are prepared to do what it takes. We are bracing to possibly keep guests overnight," spokeswoman Sherylon Carroll said.